Amazing. Incredible. Stunning. Unbelievable. None of these adjectives quite live up to the Sweet Creek Trail, near Mapleton and one hour from Eugene. I even used a thesaurus. This trail stands on its own, without superfluous descriptions. Eleven waterfalls line a one-mile trail in the forest near Mapleton, Oregon. ELEVEN. E. L. E. V. E. N. Try taking photos of all of them, I dare you. One waterfall flows into the next, and it’s hard to keep your eyes on the trail. I think I photographed nine on our recent trip, and we were enthralled with the experience. There are two trailheads, the Homestead Trailhead and the Sweet Creek Falls Trailhead. Homestead is the more popular, offering the full 1.1 mile hike (2.2 out-and-back) with 11 waterfalls. A picnic table and a vault toilet are located on a small loop parking lot. On our visit, the parking was full and people were parking up and down the road as well. We managed to find a vacant spot right next to the bathroom (hooray!). 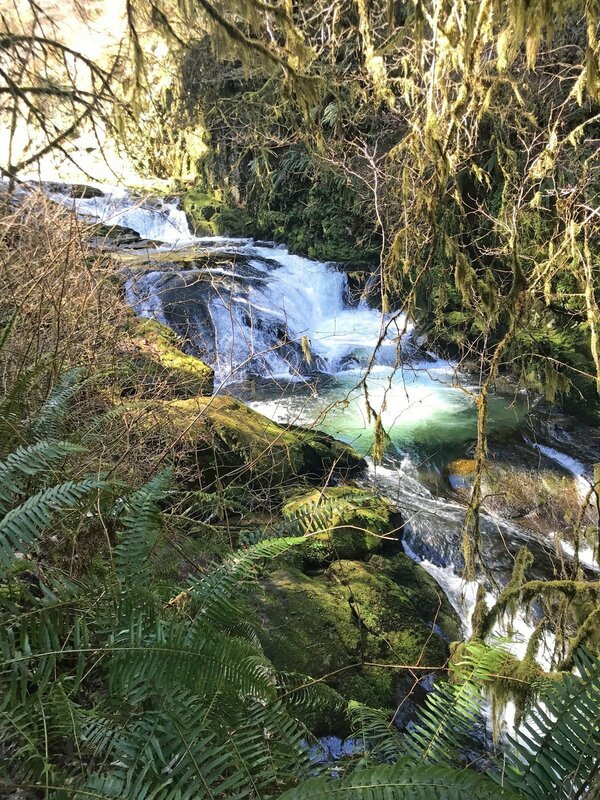 If you’re short on time, or just want to see the star of the show, park further up the road at the Sweet Creek Trailhead, which offers a 0.4 mile trek (0.8 out-and-back) to the Sweet Creek Falls. It says Sweet Creek Trailhead, but this is located at Homestead Trailhead. I suspect it just means that it’s a trailhead on the Sweet Creek Trail. At any rate, this was the start of the trail for us. We snapped a pic of the map and took off. Tips before you go: The trail is not strollerable, so pack a baby carrier! And there are metal grate catwalks on some of the trail that some dogs are uncomfortable with. It lives up to the hype. Every word is true. Sweet Creek Trail is spectacular. Right off the bat we had things to see. The first bridge was just steps from the parking lot, and of course we had great fun clomping across the wooden bridge. Next up was a massive tree that had fallen, and damaged a section of trail. It’s still passable, and not particularly dangerous, but hold hands with little ones. Damaged trail from a fallen tree. The root wad is just out of sight in the photo, so even if you fell in, you wouldn’t fall far. And then the waterfalls. I attempted to count them, and to photograph each one, but there were so many! And sometimes one flowed right into the next. I’ll admit we almost all tripped a few times, because we were so wrapped up in watching the creek and the falls that we didn’t watch the trail. Even the creek is lovely, as the colors move from white water, to pale seafoam effervescent, to deep aqua. On our day, the sun was bright but low in the sky, not the best for photography, but you’ll get an idea of just how majestic these falls are. The first (maybe?!) waterfall along the trail. Most of these don’t have names, as far as I can find. We did capture videos of many of them, and we’ll share each of those as well. The waterfalls are spaced pretty regularly along the trail, and with 11 waterfalls in only one mile, that means you’re seeing at least one every 1/10th mile, or about every 500 feet. This makes it a great trail for kids of all ages, because there’s always something to see. Just as you pass one waterfall, the next is in view. Speaking of the next one, this is the next waterfall we saw on the Sweet Creek Trail. It’s a pretty impressive waterfall, and we spent a lot of time taking photos and videos from the trail. *Note: I hear that during the summer, when water flow is lower, some of the waterfalls slow to a trickle. Still beautiful, but different. Our trip was in March when water flows were high. Also due to this, we didn’t venture into the creek or take chances balancing on rocks to get better photos. We stayed safely on the trail. Locals say the pools below many of the falls are perfect summer swimming holes. Next up is a trio of small waterfalls that each empty into deep aquamarine pools. A passing hiker told us these are great summer swimming holes. I love the way the pools seem to glow from within. I tried really hard to count waterfalls. They say there are 11 along the trail. Certainly there are a lot. I didn’t get photos of 11 separate falls, so I assume that I either missed one or two, or that some of these multiple-cascade falls counted as more than one. At any rate, each one was uniquely beautiful and many were themselves worthy of the trip. Next up, another series of small falls that slide from one pool to the next, rippling and turning the water effervescent. Several of the waterfalls have some height to them. They become thunderous, and I imagine if we were close enough, we could feel the spray of the water. Somewhere near the 6 mark (ie our rough count of waterfalls) is Annice Falls. Besides Sweet Creek Falls itself, Annice Falls is the only one with a formal name. At the pinnacle of the catwalk is Annice Falls. The more you see of it, the more impressed you’ll be. Annice Falls is a 35-foot waterfall, named for Annice Marie Ellingson Johnson who was the secretary at Mapleton Elementary for more than 30 years. She was born and raised on a ranch on Sweet Creek. Technically, this is a waterfall on a tributary of Sweet Creek, and I’ve read it slows to a trickle in the summer. But in March, it was beautiful and maybe my favorite of all the waterfalls. Photo credit: Camille. Keep hiking, because the fun isn’t over yet. There are a few more waterfalls before you get to the end of Sweet Creek Trail. I’m not sure this one even counts as a waterfall, as I’m sure it dries up during the summer. But I was impressed with how high up it started, maybe 50 feet? This was a family favorite, and we stopped to admire it both times we passed it. After I posted this photo on Facebook, a reader posted his summertime photo of the same falls. It was much smaller, but just as beautiful. We clearly need to return to Sweet Creek Falls with our kids this summer, so we can see it again in a new season. My daughter, Camille, stepped to the edge of the creek to capture this photo. I can almost feel the cool of the spray, and hear the roar of the falls. Also one of Camille’s photos. Light was challenging, as we were hiking under full sun. But I think this is a neat photo nonetheless, as it shows the activity of the water as it flowed over the rocks. Finally, without further ado, Sweet Creek Falls. The end of this portion of the trail is a great place to sit awhile and take in the falls. Sweet Creek Falls is comprised of 4 tiers, cascading for a total of 70 feet. We could see maybe half from the shore. During the summer, at lower water levels, it would be easy to see the entire waterfall from the middle of the creek, but during winter the water rushes too swiftly to attempt it. It was a very sunny day, so our photos don’t do Sweet Creek Falls justice. And due to the strength of the rushing creek, we couldn’t see the entire waterfall. One of our little ones admires the falls. She’s not even 2 years old, but knows that this is something wonderful. While we sat to enjoy the view, our little ones scrambled around on the rocks. It was a great chance for them to have some freedom before trekking the mile back to our van. Naturally on the way back, we hiked faster. But still had time to enjoy our favorite parts again. The catwalks, Annice Falls, the blooming Skunk Cabbages, and interesting stumps. The water rushed below our feet. Kind of cool, kind of creepy. But mostly cool! A springboard notch left in an old stump. When Oregon was first logged, the trees were so big that loggers would use a platform to stand on while they cut the tree. These were called springboards and were anchored into the trees themselves. Decades later, the stumps…and their springboard notches…remain. Nursery stumps…as a stump decomposes, often seeds will take root in the soft wood and new trees will grow from the remains of the old. Camille captured a rainbow over one of the falls. Oregon Outdoor Family! We stopped for a selfie near Annice Falls. Our intent was to include the waterfall in our photo, but getting 8 faces in the same photo is hard work. The faces of our bonus kiddos are blurred to protect their safety and ours. We came around the last bend and saw our van. With 6 kids (2 with special needs, and 2 who are toddlers) our hike lasted about 3 hours. It required 2 packs of jerky, 6 applesauce pouches, and 6 granola bars. We used over a gallon of water. And changed 3 diapers at the trailhead. And yes, we packed out all of our trash, along with some from other people. The Homestead Trailhead has a vault toilet available. No lock, so be prepared to guard the door, or knock before you enter. No fee to park at this trailhead, or hike the trail. A picnic table is available at this trailhead. The trail is not accessible for wheelchairs or strollers, due to narrow spots, steps, and concessional roots. Need a shorter hike? Drive up past Homestead Trailhead to the Sweet Creek Falls Trailhead. No amenities here, but it’s only a short hike to the Sweet Creek Falls. Travel Highway 126 to Siuslaw River Bridge in Mapleton, Oregon (15 miles east of Florence or 46 miles west of Eugene). Sweet Creek Road #5036 is located on the East-side of the Mapleton bridge. Travel South on Sweet Creek Road for 10.2miles, Homestead Trailhead is on the right. Sweet Creek Trail is listed in the following guidebooks about hiking with kids. We own both of these books and recommend them for any family that would like some extra guidance in where and how to hike with kids near Eugene. Be sure to read more of our posts about hiking with kids near Eugene! We also love visiting waterfalls with our kids.